100% BPA-Free & PET/LDPE material and meet FDA and EU Food Safety standard. Gamma-ray Pre-sterilized and also Tamper-evident safety seal.Double zip-lock with recyclable and leak proof.Strong self-standing base.Heat-sealed sides prevent splitting.Large writing area to mark date and other information.Recyclable and Eco-friendly. 100% BPA-Free with Pre-sterilized and meet FDA and EU food safety standards.Tamper-evident safety seal.Double zip-lock, recyclable and leak proof.Strong self-standing base.Heat-sealed sides prevent splitting.Ideal for refrigerator and freezer storage.Large writing area to label name and date. 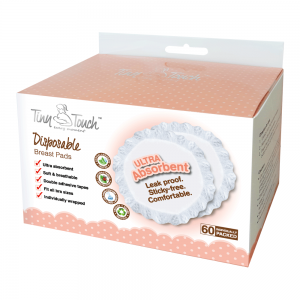 Ultra absorbent and guarantees dry and sticky-free comfort.Non-woven material is breathable and gentle to the skin.Patented linings are gentle to touch and gives optimum comfort.Lock guards prevent milk leakage. 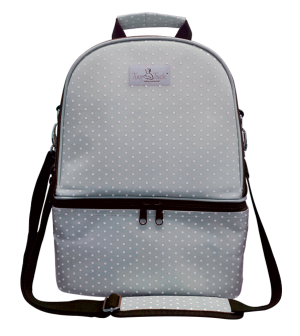 Fully designed to store bottles & breast pump in one bag.2 ways carrying – hand carry & shoulder sling.Holds up to 6 wide neck & 8 standard neck bottles.Built in compartments for organized storage.Fully insulated inner to chill breast-milk for minimum 8 hours. 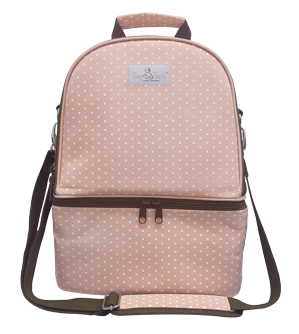 Fully designed to store bottles & breast pump in one bag. 2 ways carrying – hand carry & shoulder sling. Holds up to 6 wide neck & 8 standard neck bottles.Built in compartments for organized storage.Fully insulated inner to chill breast milk for minimum 8 hours. Double-Frequency Suction a creative new suction experience on both high & low frequency. 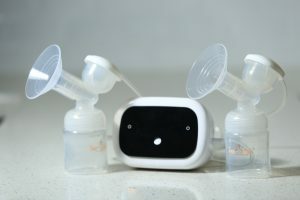 All-In-One Mode with Provides 5x massaging & 1x sucking is good to relieve the pain of breast engorgement and to stimulate lactation.LED Touch Display. All parts are BPA free and safe for sterilization Rechargeable lithium battery. 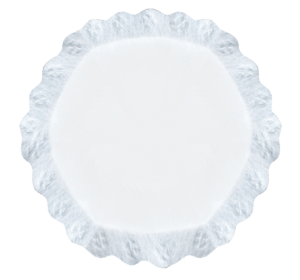 Full Silicone Breast Shieldwith Passed FDA approval. Soft, comfortable and easily fit different breast curves.All-in-One Mode with 5x massaging and 1x sucking is good to relieve the pain of breast engorgement and to stimulate lactation.Super Tee Joint Gas Storage with Smooth and stronger suction. Simple structure and made assembling and washing so much easier.Rechargeable lithium battery. Humanized Ergonomic Handle Gives firmer hold and better grips. Pumping without worrying about strenuous strain on your fingers and hand muscles. Removable Tee Joint Interface Easily removed for cleaning. Better hygiene with no dead angle Full Silicone Breast Shield Soft, comfortable and easily fit different breast curves. Better security without leaking and comfort during pumping. Breast Milk Storage wide neck Bottle 100% BPA Free with Sterilizer-safe and non-toxic.Made of high quality polypropylene plastic (approved by PDA) which is designed to retain beneficial properties of breast-milk for a longer period.Specially designed sealing disc prevents storage bottle form leaking.Compatible with all Tiny Touch range of breast pump. 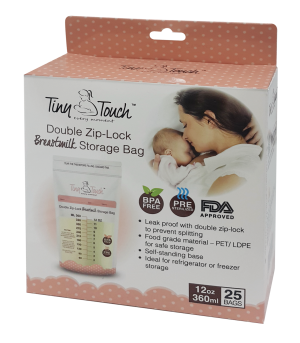 Breastmilk Storage Bag 100% BPA FREE and meet standards EN14372,EN71.3.EN1186.Tamper evident safety seal and double ziplock,resclosable & leak proof.Self-standing base & deep freezer safe.